Welcome to our online poker room reviews: We only review the most trusted and respected internet poker rooms, so feel confident in choosing any of poker rooms below. We cover each room in great detail talking about many aspects of the poker site like the poker games offered, multi tabling, poker software, poker traffic and the poker sites bonus offerings. Keep a look out for poker rooms that accept / allow US players if you are a resident of the USA or check out our USA Accepted Poker Sites - US Deposits Allowed. 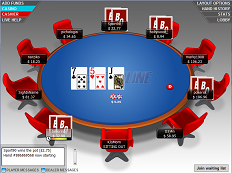 BetOnline Poker opened in 2011 and has become one of the top three poker rooms for American players. The poker rooom also provides a full online casino and sportsbook. Bet Online has an excellent team of customer support reps, provides a native Mac poker site and features plenty of promotions.